This sketch waits for a UDP packet on a local port. When a valid packet is received, an acknowledge packet is sent back to the client on a specified outgoing port. The WiFi shield uses pins 10, 11, 12, and 13 for the SPI connection to the HDG104 module. Digital pin 4 is used to control the slave select pin on the SD card. 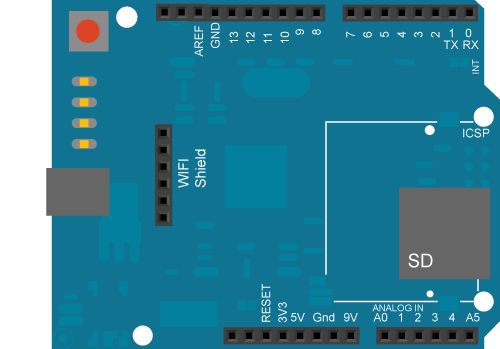 In the above image, the Arduino or Genuino board would be stacked below the WiFi shield. WiFi library – Your reference for the WiFi Library. WiFi Shield – Product details for the retired WiFi Shield. Getting started – Getting started with the retired WiFi Shield. Connect No Encryption - Demonstrates how to connect to an open network. Connect With WEP - Demonstrates how to connect to a network that is encrypted with WEP. Connect With WPA - Demonstrates how to connect to a network that is encrypted with WPA2 Personal. Scan Networks - Displays all WiFi networks in range. Simple Web Server WiFi – Turn on and off an LED accessing this simple Web Server. UDP NTP Client - Query a Network Time Protocol (NTP) server using UDP. WiFi Chat Server - Set up a simple chat server. WiFi Web Client - Connect to a remote webserver. WiFi Web Client Repeating - Repeatedly make HTTP calls to a server. WiFi Web Server - Serve a webpage from the WiFi shield with Analog Input values.